I coach business owners on how to run a sustainable business with effective productivity strategies. Digital course creator for entrepreneurs looking to scale their busines with corporate clients. 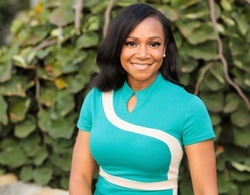 Shermikia Lemon is an entrepreneur & productivity coach. Through her signature coaching and training company, Peacefully Profitable, Shermikia helps her clients become noticed with strategic planning, marketing strategies and through her signature course #ExpandWithCorporate which was created for entrepreneurs looking to grow and scale their business with high-end corporate clients. Shermikia has had the opportunity to speak in front of hundreds of leaders, CEOs, Business Managers and Executives to deliver her signature presentation. She has also been featured on many podcasts, has been seen in Forsyth Woman’s Magazine, Stars & Stripes (Europe), HRMAG, and is a regular trainer for the Women’s Resource Center. Shermikia is the host of the Peacefully Profitable Podcast which can be heard on iTunes, SoundCloud, Google Play and more. This podcast is a weekly conversation on discovering your passion and turning it into profit, productively balancing life and finding peace. Have you worked with Shermikia? Tell your friends! Shermikia doesn't have any reviews yet. Shermikia hasn't submitted any articles.